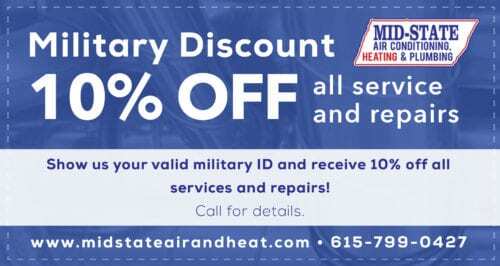 For trusted furnace repair and maintenance services in Nashville, TN and the Middle Tennessee area, contact the experts of Mid–State Air Conditioning, Heating & Plumbing today. 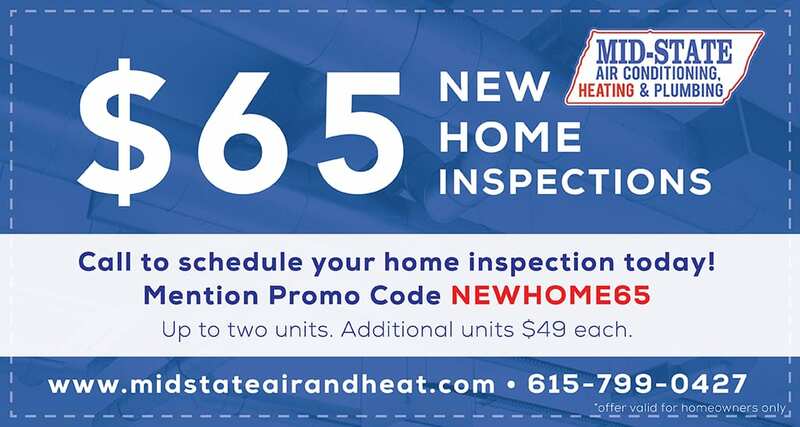 We have been helping homeowners in the region ensure their furnaces remain in top working condition for many years and can do the same for you with ongoing maintenance or targeted repair services in Nashville. There are many signs that your furnace may need to be repaired. 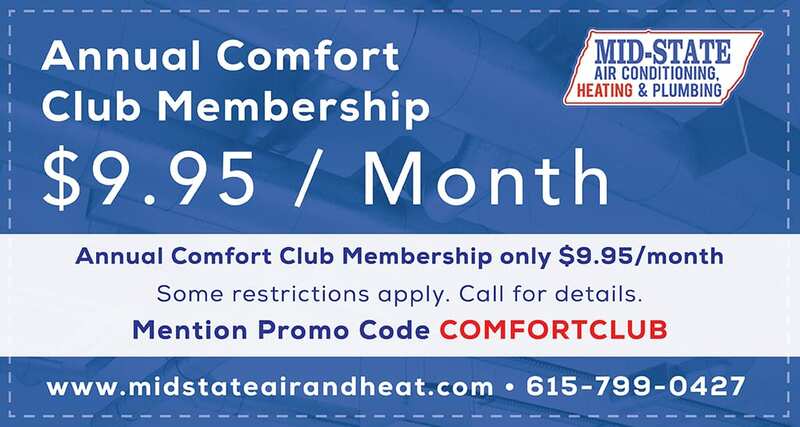 One of the most common signs is that your furnace no longer provides ample heating for your entire Middle Tennessee home. This may only affect one or two rooms or may affect the entire home, but whatever the case, it is important that you have a new system installed as soon as you notice such a problem. Often accompanying this type of problem, though it can occur well before it becomes an issue, is an increase in your monthly energy bill. Pay close attention to your gas or electric bill to see how much you’re consuming to heat your home. If the number increases dramatically from one month to the next, it’s likely you need repairs performed on your furnace. Other common issues that may lead to repair calls for your furnace include loud noises from the system, shutting off before the room is warm or inaccurate thermostat readings. One of the most effective ways to ensure that your furnace requires as few repair calls as possible is to have a preventive maintenance plan. With preventive maintenance, you ensure that your furnace is inspected once a year, usually right before it’s turned on for the first time. Such maintenance goes a long way towards extending the life span of your furnace by keeping it clean and ensuring it operates at peak efficiency every winter. Regular maintenance will give our Nashville technicians a chance to clean the system, check for common problems, tighten wiring, lubricate and replace any moving parts, and generally ensure that the system is ready for the coming winter. We offer a number of preventive maintenance plans designed to match the specific needs of your furnace. To learn more about each of our plans and find out which is the best fit for your specific needs, give us a call in Nashville, TN today and ask to talk to one of our professionals in furnace maintenance and repair. 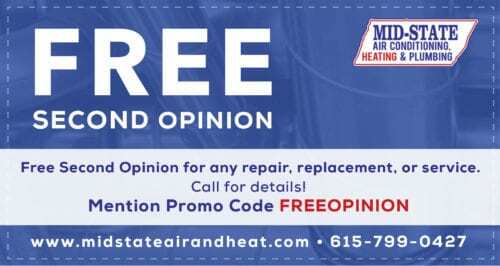 If you are interested in learning more about having a preventive maintenance plan added to your furnace, or if you would like to have one of our Nashville, TN furnace repair specialists visit your home, contact the experts of Mid–State Air Conditioning, Heating & Plumbing today. We can ensure your furnace continues to work properly for many years to come, providing ample heat for your family winter after winter.